Jesus had been doing many miracles. Now, the Pharisees and teachers of the law wanted Jesus to do a special miracle just for them. Jesus called them wicked! He said only one sign was going to be given to them; the sign of Johan. Johan was in the belly of the great fish for three days and three nights. Jesus said just like Jonah, He would be in the belly of the earth for three days and three nights. Jesus said when Nineveh heard of their impending destruction, the repented of their sinful ways, but now someone far greater than Jonah was here and no one is repenting. The people of Nineveh will be present with the people of Jesus’ time and condemn them for their unbelief. Jesus also told a short parable of a man who had a demon. When the demon left the man it searched the earth for a new place to live, but could find nothing. The demon decided to return to his former home. When he arrived back to the man, he found that everything had been cleaned up and put in order. So, the demon went and found 7 other more wicked demons to go and live in the man. Now the demon possessed man is worse off than he was before. This is how it is with the wicked generation that lives with Jesus. 1. Before class, put the squishy balls in the muddy water. Take one ball out and put it in a glass bowl. 2. When all the children are sitting, place the bowl with the muddy ball in the center for all to see. When you tell the children about the man with the demon, roll the ball around in the bowl until the bowl is pretty dirty. Remove the ball when the demon leaves the man. Put the ball back into the bucket of muddy water with all the other balls. 3. Take a rag and begin cleaning the dirty bowl. The story says the man cleaned up and put everything back in order. Show the children the now clean bowl. 4. Bring forward the bucket of muddy water. Take out the first ball and put it in the clean bowl. Add the rest of the muddy balls when you tell the children that the first demon invited 7 more wicked demons to live with him. 5. Ask the children which was better, the one ball, or the 8 balls. 6. Ask the children how we can prevent all the dirt from getting into our bowls. Tell the children that only Jesus has the power to make and keep us clean, because on our own, we will continue to do dirty things. Take the large ball and put it in the second glass bowl. 7. Tell the children that there is no way for the muddy balls to get into this bowl as long as the large ball is here. In this passage, Jesus is predicting his resurrection. He would indeed die and be buried, but three days later he would come out of the grave! Jesus has power over this wicked, sinful world and over death! Jonah, Jonah, have you heard? Said the Lord, "Go preach my Word." Jonah said, "That's not for me!" Soon the ship began to sway. Jonah said, "It's for my sin! Pick me up and throw me in." Came a fish and gulped him down. Tell the folks about your way." 1. Place all the balls in a large pile at one side of the room and the two buckets on the other side with some space between them. 2. Divide the class into two teams. Everyone will throw the balls as fast as they can into the buckets. In order to throw the balls, they must be standing behind the line where the ball pile is located. They may run forward to retrieve balls that missed the buckets, but they cannot throw it until they return to the throwing line. 3. The team with the most balls in their respective buckets wins. 1. 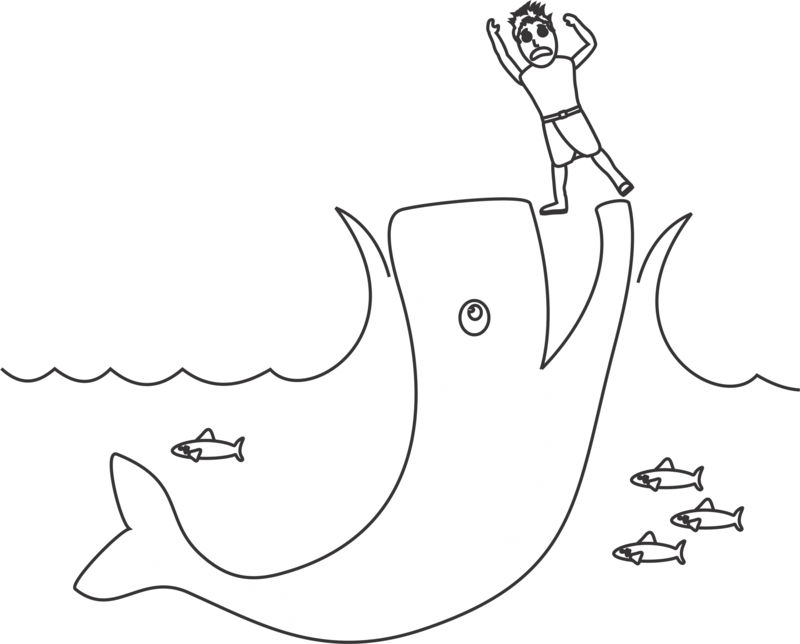 Trace the whale template onto blue paper. 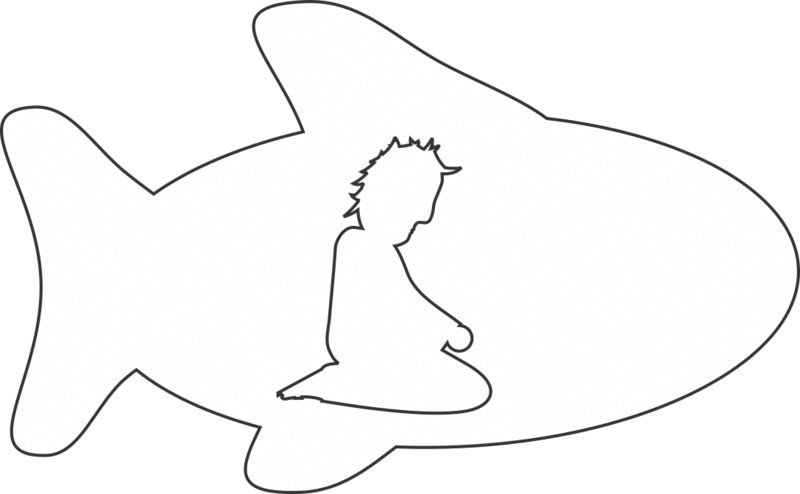 Cut out the whale so that the outside remains whole. Discard the inside. Trace the Jonah template onto black paper. Cut out Jonah. 2. Taking one piece of contact paper, peel off the backing, laying it adhesive side up in front of you. Take the yellow and orange tissue paper and stick it to the adhesive side of the contact paper. 3. Place Jonah in the center of tissue paper page. Cover the tissue paper page with a second page of contact paper, adhesive side down. 4. Take the two blue papers with the fish cut out and hold them up so that they line up the same. 5. Place one blue fish on each side of the tissue paper contact page. Glue the blue pages to the contact paper. 6. Turn the completed craft over, so you can no longer see Jonah. Hold up to the light to reveal Jonah inside the fish!